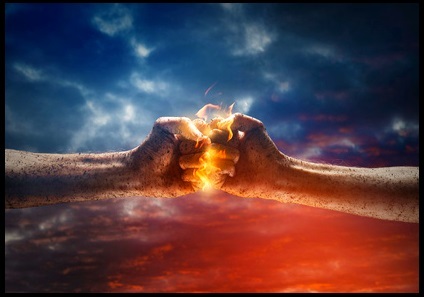 Dr. DeFoore's Healing Anger Newsletter entitled "Anger Explosions And How To Prevent Them"
Why Do We Have To Explode? Fortunately, everybody doesn't have to explode. However, as you'll see in this newsletter, there are many kinds of explosions, and they affect most of us, whether we realize it or not. We'll go through the step-by-step process that leads to anger explosions, so you'll understand why they happen. Then, we'll look at the different ways the explosions occur, and what you can do about them. As you will discover here, it all begins with a basic neglect of our need for emotional intelligence education early in life. Let's look at how this can lead to an explosion. We are all born with the powerful need to love and be loved, and that need is never perfectly met. So we feel pain, loss and sorrow, and then we become afraid of that pain happening again. This is a natural part of human emotional development. Next, we start looking for ways to protect and defend ourselves from future pain, so we don't have to be vulnerable and afraid. This is where anger comes in...anger is a protective emotion designed to push away and push back. Unfortunately, we learned that anger is bad, so it got suppressed into our subconscious minds, where it naturally becomes wild, primitive, and...explosive. Some of us are well programmed to be passive, and never lash out at others, so they never explode in the usual way of an anger outburst (read on...the explosion happens inside). Others hold the anger inside until they can't stand it any more, then they release it in an aggressive, out-of-control manner, usually hurting those they love the most. So, the reason we "have to" explode is that we never learned how to release anger in healthy ways, we suppressed this powerful emotion, and it just won't stay down...it has to erupt one way or the other. One very common result of this is depression. Suppressed anger often leads to depression, simply because it is depressing to feel hurt and afraid, and feel like there is nothing you can do about it. "Anger is like a fist held down...magnificent energy wasted." Healthy anger expression would be the "something you can do" about the suppressed anger, hurt and fear, but most of us don't really know what healthy anger is, or how to express it. Just to give you an excellent picture of healthy anger, watch these adults standing up for kids getting bullied, in the video below. Emotions work in and on the central nervous system of your body. The explosions we're talking about here are physical in origin, and subconscious...nobody ever decides to explode. Daniel Goldman, author of the ground-breaking book, Emotional Intelligence called these explosions "emotional highjacking." It's like your anger is a stranger hiding in the back of your mind, and it only pops out when it's ready, without your permission. If this doesn't apply so much to you, keep reading, and I think you'll find yourself in here somewhere. Are you really good at controlling your anger and keeping it inside? Or, do you feel like you don't have any anger? The next question would be, "How's your health and energy level?" If you're suppressing your anger, the answer is probably some version of, "Not so good." The most familiar and mild type of explosion is the common "losing your temper," with yelling and language and saying things you've been keeping inside. While this is mild and fairly common, it can do a lot of damage over time. A worse type of explosion, hopefully not too familiar, is one with physical aggression and/or violence. This can range anywhere from hitting walls and breaking things to hitting and assaulting people. Another type of explosion, that is very common, is an anxiety attack. An anxiety attack is a kind of explosion in the nervous system. Why does suppressing anger lead to anxiety attacks? Because if you're suppressing your anger, you're not standing up for yourself, and if you don't stand up for yourself, life can be very intimidating...which is anxiety provoking. And finally, there is the type of explosion that is really better called an "implosion." This is where there is a health breakdown resulting from the stress of withholding anger on a chronic basis. It drains energy, leading to depression, and in many cases, physical illness. The solution of course, is to release and express your anger in healthy ways. This may seem hard to learn, but it's a whole lot easier than living with these types of explosions we're talking about here. Learn more about anger, depression and your health on this web page devoted entirely to the subject. 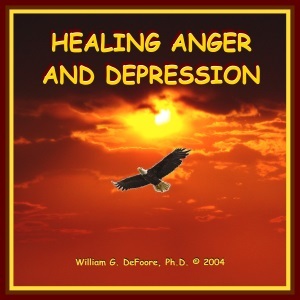 This highly effective audio program, available as CDs or MP3 download, will help you understand, heal and prevent anger and depression problems so that you can heal and live a happy, healthy life. In this program, Dr. DeFoore will guide you through an understanding of how emotions work and how you can use them in healthy ways, so that you can be the good, upbeat person you want to be. Get your copy now. New web pages for you. Read new contributions from good folks like you, such as How Do I Know If I Need To Walk Away From This? by a woman who's trying to assess whether her relationship is salvageable or not, and I Have An Alcoholic Stealing Homeless Son by a very sad woman looking for understanding and support.